Confession, since last Thursday I have worked on the drawing. Each time I walked past it another area called out to be worked, so one thing led to another and Classic was finished today. Almost the entire drawing was since Classic #7. Here are a few of the areas: the bodice and skirt, her legs and feet were reshaped (they’ll forever haunt me because of the frisket sticking), her face was widened and refined, her left hand and arm slightly shorted, and the right hand/fingers extended a bit. The tools and materials used in this piece: 12×9 Strathmore Bristol Vellum paper; pencils included charcoal, graphite (gave the reflective qualities on the floor) and carbon (on the drapes to flatten and push them back); a kneaded eraser, Blu Tack, and a Pentel Clic Eraser; blending accomplished with felt, tortillium and stumps. Let’s not forget frisket film that caused all the problems with the legs and feet (overall it’s effective, I need practice using it). 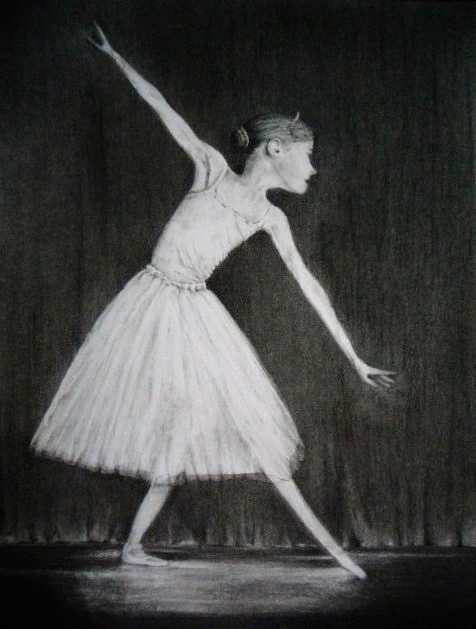 A reference image used (taken by Bronwyn Chelius of pmp) although drawing free-hand changed the ballerina quite a bit. Thank you for staying with the drawing project – it was a great learning piece. Here she is, Classic. She is beautiful, love the texture in the back, she has this grace and beauty. Bravo! She is so beautiful and ethereal Mary! Great job! Thank you Madhu – really appreciate it! Frisket is so very tricky. I’m fairly hopeless at it. I think it’s the sort of technique that requires LOTS of practice. Kudos to you for working with it so well. Lovely, Mary! Thanks Elena! I’m going to give frisket a go again, but this time with a less complicated subject. I definitely see the benefits from using it. Thank you so much Gallivanta! It was a wonderful piece to work on and now I get to choose my next subject, stay tuned . . .
Is choosing a challenge in itself? Not really – I have such a long list of things that would make great subjects to draw. I usually go for subjects that I haven’t tried to draw before with some element that will give me a challenge. This next one is going to be a still life composed from items around the house (clock, book, etc.) – but with elements that are new for me to draw. Excited to get started. So perfectly poised there in the spotlight .. She IS a classic . Thank you Poppy for your special comments, you made my day! Thanks for sticking with the process, at least this one didn’t go any longer than 8 weeks. she is delicate yet fiercely strong! what a great role model she makes for all women! Hey Z! Thank you so much this piece really drew me in while drawing. Thanks for your encouragement, I enjoyed learning about different techniques and happy that I finally completed my first full human profile (have a ways to go in accurately drawing limbs, etc. – will get there one day). Without your Thursdays Time-out for Art – I wouldn’t be drawing, thank you for infusing us all with your generous spirit of creativity. Have a great weekend! Thank you so much Mamie – what a beautiful thing to write. Hope you have a lovely weekend! The graceful little thing, Mary ! How thin they are, those ballerinas ! – and how can someone so young position herself so elegantly …?! Thank you M.R. – those gals are pretty thin aren’t they? Makes me wonderful how they can muster up all the strength needed to be so athletic on the stage. I do love their grace – have a beautiful weekend! She’s beautiful Mary! You captured her emotion and the spotlight on her is great! I never liked using frisket for anything!! I wouldn’t have ever thought to use it on a pencil drawing. I bet you are the only one who can see where you used it. Have a fab weekend. Hi Rhonda, thank you so much. The frisket is very interesting, while it worked perfectly keeping the surface completely clean while the background was drawn there were two issues that I’ll have to work with the next time I use it. First, it was difficult working with laying down a large sticky figure with little parts (like the legs and feet) – it would have been easier if the subject was a less complicated structure, and second I’ll need to remember to gently smooth it out while laying it down on the surface and not push down on it (that’s when it sticks making it difficult to remove). Absolute grace! What a joy was to be part of every step of progression of this marvelous creation and she is a beauty.The contrast of this piece plays a key point, she appears to be weightless, delicate and fragile in front of the heavy dark curtain, a perfect balance! Congratulations Mary, your classic is an outstanding success and I’m happy I took part in her creation! Hi Eva, thank you very much for your thoughts and assessment. Love your comment, “the contrast of this piece plays a key point . . . delicate and fragile in front of the heavy dark curtain, a perfect balance,” it was what I attempted to accomplish. Thanks for sticking with the process – it was a great learning experience for me. Have a wonderful weekend! A picture to its perfection! We have followed all the stages & today when I opened the post my first thought was… it’s finished, which you confirmed. I wish I could go back to painting, it’s nearly a year I’m completely blocked, no poems & no paintings, all I can do is post my photography which is a kind of poetical-imagery (at least it’s my intention when I shoot a peaceful spot of nature :)) accompanied by my hopefully eloquent description, but I’ve learnt to let nature follow its course & wait… meanwhile I’ve learned a lot in different avenues but I believe it’s all connected. Thanks for your feedback and assessment of the artist block you find yourself in. It’s tough when an artist goes through the block, I have an artist friend whose been going through this for about two years now and it hasn’t been easy. I’m hoping that something, one day when you least expect it, will awaken your creative juices. I’m confident this will happen, hopefully before too long. 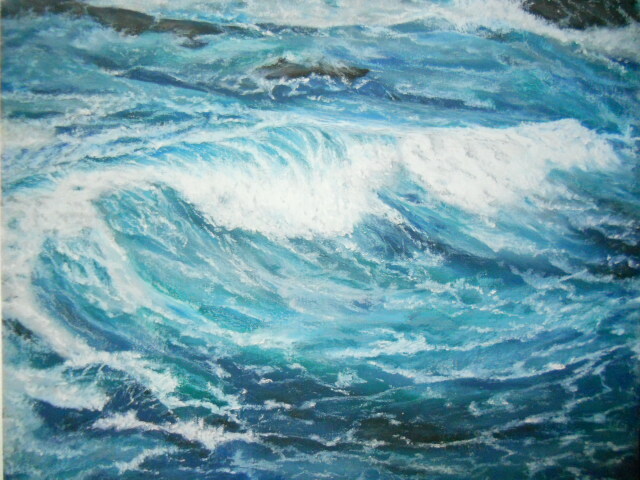 Take care and thank you for following and commenting, I really appreciate it. Your support truly touches me, thanks! I am so impressed Mary! Your classic ballerina is truly classic and your talent for capturing her grace and beauty is obvious in this one example. Thanks Dorann, I haven’t drawn a full profile of a person before so this was an interesting project for me to take on. See some areas that I’d like more practice on. Have a wonderful weekend! Mary, this is a wonderful drawing. Love her pose and you have created such great depth and detail in the piece. Hi Janell, thank you so much.